But what to order? It's been awhile since we've had a Waffle House fix, so our eyes were a bit bigger than our stomachs. Lawman ordered up the All Star Special Breakfast: Two eggs over medium, wheat toast, three strips of bacon, cheese grits, and a waffle. 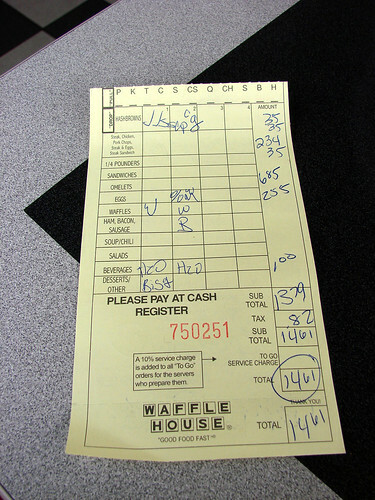 I ordered a waffle, one biscuit with sausage gravy and a large order of hash browns scattered, smothered, covered, and peppered--for the uninitiated that's hashed brown potatoes: "scattered" (spread on the grill), "smothered" (with onions), "covered" (with cheese), and "peppered" (with jalapeño peppers). 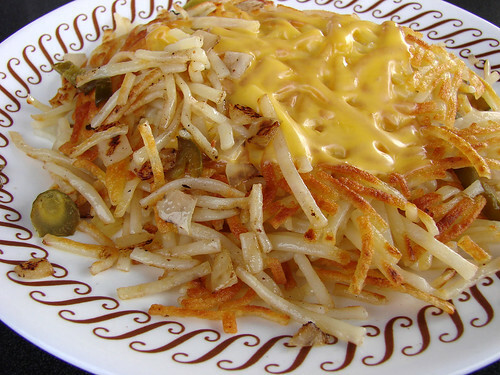 You can also get your hash browns, "chunked" (with diced ham), "diced" (with diced tomatoes), "capped" (with mushrooms), "topped" (with chili) or "all the way" (with all available toppings). This was one mighty breakfast. 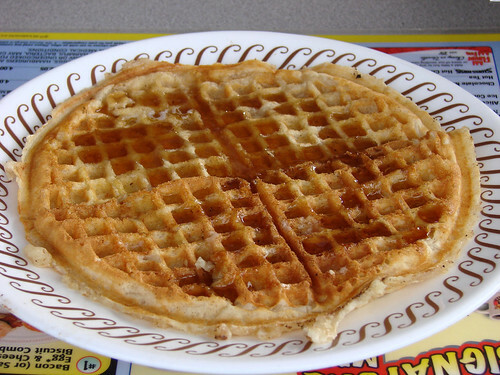 Moist yet slightly chewy, sweet and slightly malty, Waffle House waffles are always a treat. 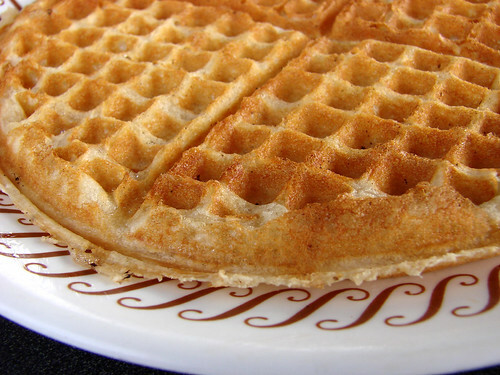 Hello, waffle. I love you! Waffle House waffles are sweet enough for me to eat on there own, but Lawman likes his with syrup. 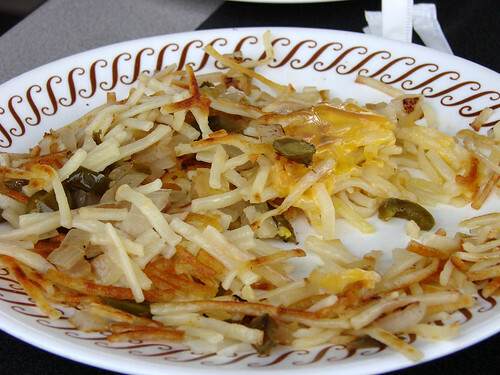 Here are the scattered, smothered, covered, and peppered hash browns. 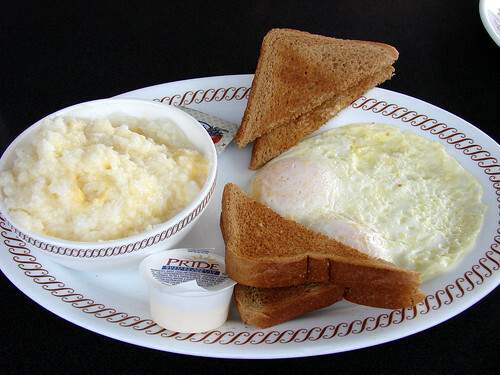 I usually go for hash browns scattered, smothered, covered, and chunked, but the pepper was a nice kick. The sausage and biscuits were skippable. 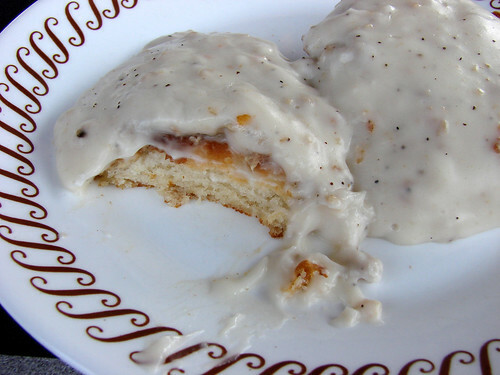 While the biscuits were buttery and pleasant the sausage gravy wasn't much to write home about and with so many other tasty options on the menu, safe the tummy space. Our whole giant breakfast was under $15. Not bad at all. Especially for Valentine's Day Dining. As we were finishing breakfast we overheard a couple at the counter say that they had driven from New Jersey just for a WH fix on V-Day. Aww. 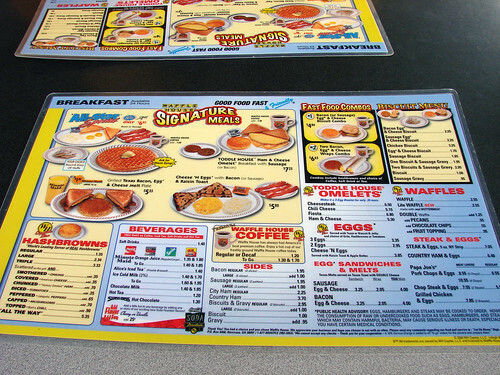 Waffle Houses are located in 25 states: Alabama, Arkansas, Arizona, Colorado, Delaware, Florida, Georgia, Illinois, Indiana, Kansas, Kentucky, Louisiana, Maryland, Mississippi, Missouri, New Mexico, North Carolina, Ohio, Oklahoma, Pennsylvania, South Carolina, Texas, Tennessee, Virginia and West Virginia. Click for locations near you. Jealous! I freakin love WH. 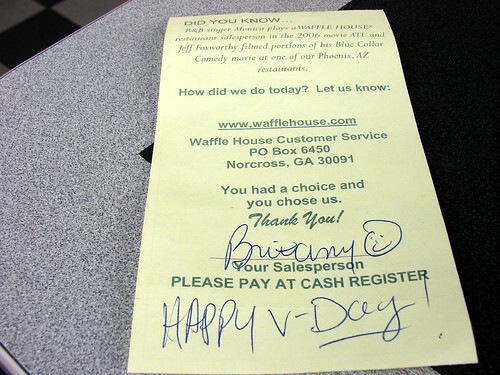 Sounds like a lovely V-day breakfast to me. if either Blondie or Brownie would like to go to Chik Fil A i would be more than happy to treat them. You're making me hungry! 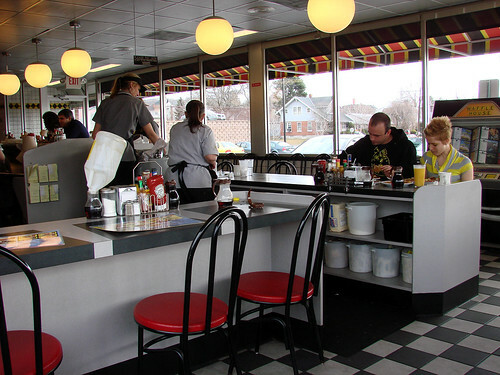 I worked at the Waffle House for years and now I'm missing the food! 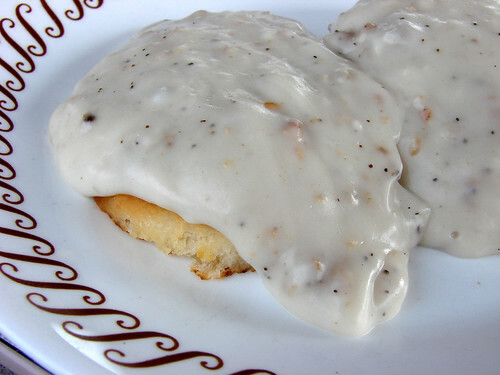 But when did they start selling Biscuits and Gravy? That's a new one on me. 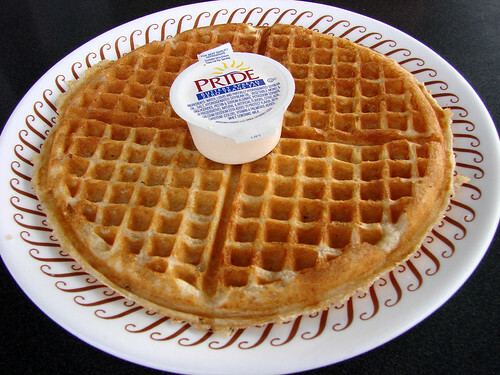 I know I'm a little late here and I don't want to burst your bubble, but you did not visit the northernmost Waffle House. Bethlehem is at 40.63 degrees north. There are several Waffle Houses in Toledo which is at 41.67 degrees north. In fact I don't think you even visited the northernmost WH in the Allentown?bethlem area. It looks like you were at the Cherry Lane location. 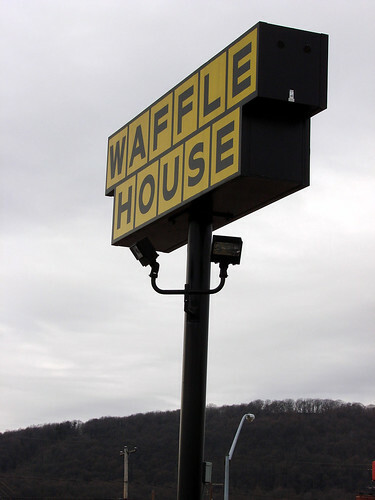 There's a Waffle House on Airport Road a couple miles north of where you were. Sounds like an opportunity for a few more road trips! @Mike: haha. I had no idea that there was a Waffle House in Toledo. 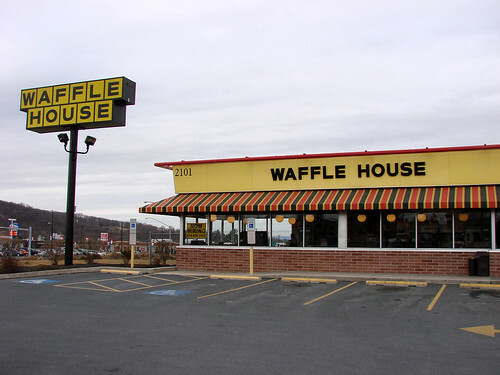 I did later discover that there is another Waffle House in Allentown and I believe that you are correct that it's slightly more northern than the Bethlehem branch though the Bethlehem location is still the closest I can find to NYC. So I suppose the Bethlehem location is the second northernmost Waffle House on the eastern seaboard. Has a nice ring, don't you think?